— Building link into city would have been “disastrous for motorists” said Cllr. A direct link between the Waterford Greeway and Waterford City centre will not be in place by the expected greenway opening date of March 25. It follows local opposition to making a minor road one-way to provide a walking and cycling link into the city centre. 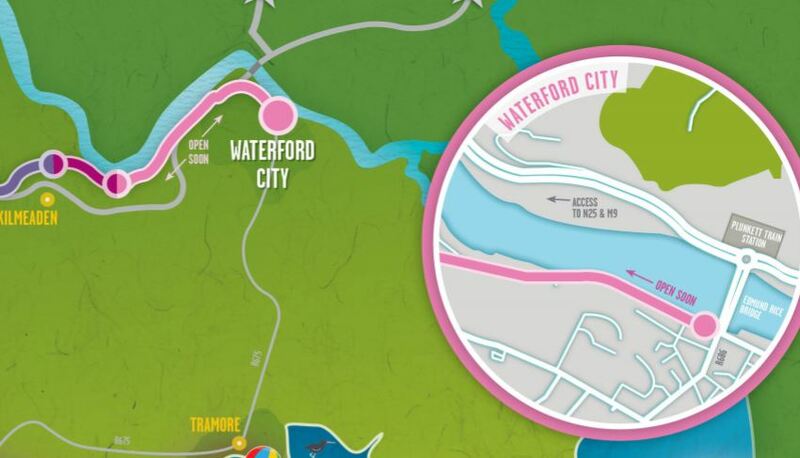 IMAGE: Promotional maps for the Waterford Greenway had the greenway starting on Grattan Quay across from the city’s railway station but this is now not likely to be the case in the short term. The walking and cycling route — which is also known locally as the Deise Greenway — will rival the length Ireland’s current best known greenway — County Mayo’s Great Western Greenway. The Waterford Greenway is supposed to be 45km long, just longer than the 42km route in Mayo. Waterford City and County Council has yet to reply to questions from IrishCycle.com but local media have reported on the issue. Last year, waterford-today.ie reported that Councillor Joe Kelly (independent) said that the planned “one way system for Bilberry Road will prove disastrous for motorists”. Cllr Kelly said: “I support the idea of the Greenway coming in as far at the middle of the Quay but this should not be done in a rushed manor, just to facilitate the opening of the Greenway. The extension of the Greenway into the city should be done in a very attractive, well designed and well-planned way, when sufficient funding is available for it. It should be beneficial to everyone and not done at the expense of motorists. To rush this development is a big mistake I believe”. The council had indicated that it hoped that the route along the road would have been eventually replaced with a waterfront route when former industrial area between the road and the river. Most of the greenway uses a former railway route and while modern housing at Waters Gate, Bilberry, blocks the path to the former railway terminus, the railway never reached the city centre on the south bank of the River Suir. Another local suggestion is to route the greenway over the Old Red Iron Bridge onto the north bank of the river and along Irish Rail tracks into the city — although it is unclear how viable this option is, once the greenway is opened, council officials and local politicians will likely become under presure to make some kind of link to the city centre. Politicians and locals in Mayo were originally very protective of criticism of the Great Western Greenway, but gradually they have increasingly pushed for safety improvements relating to similar missing links, including on the approaches to Newport and the link over the bridge to Achill Island. The Mayo greenway has also suffered some closures due to unrelated disputes between landowners and the council — this will not be an issue in Waterford as the railway route was still in state ownership and so permission access agreements were not used. A real pity an otherwise excellent project is being undermined just as it was about to become a resounding success. We never miss an opportunity to miss an opportunity. But at least the rest of the greenway is complete and on uncontested railway land. The remaining section to the city will almost certainly follow when the greenway becomes a huge success as it is very likely to. Troglodyte councillors can only hold back the tide for so long. On reflection and re-reading the article, I may indeed have been a bit harsh. This is a great project, and a wonderful example of what can be achieved when a relatively enlightened council puts their minds to it. While it is a pity that the greenway will not run from the city in order to maximise it’s potential from the get go, I would still be confident that the benefits it will bring to the city will become evident and the completion of the required infrastructure will follow. ‘disastrous for motorists’ seems a bit strong for me, but then I suppose he must think any inconvenience for motorists is in the disaster category.